IT IS a certainty that the first to use the BICEPHALOUS EAGLE [Two-Headed Eagle] were the LASCARIS EMPERORS who adopted it as their Emblem from a figure hewn out of the stone wall of a Hittite fortress in Asia Minor. The origin of all the Imperial Bicephalous Eagles is Byzantium, the Second Rome. The Bicephalous Eagle was the property of the HOUSE OF LASCARIS who conveyed it to the Byzantine Empire and it is distinct from the anterior Augustan Eagle of the Roman Empire, the First Rome. It was introduced into Russia, the Third Rome, as a dowry on the occasion of the marriage of Sophia Palaeologos to Ivan III the Great, Grand Duke of Muscovy. 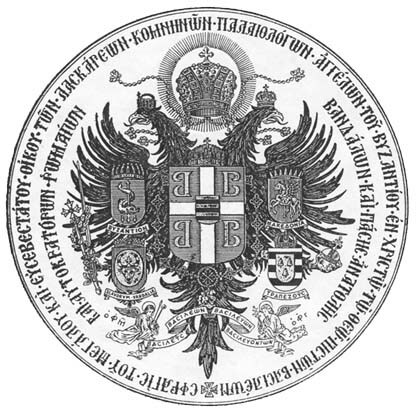 Following the demise of Communism, the Bicephalous Eagle re-appeared as a Symbol of the Russian State. Nevertheless, it has independently endured the test of time by its constant presence at the ancient Monasteries of Mount Athos, and has emerged in The Americas, the Fourth Rome or NEW BYZANTIUM. H. I. and R. H.
May his years be many and fruitful. 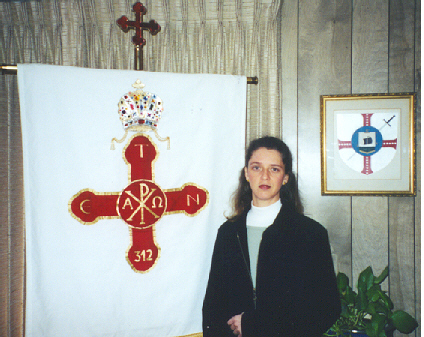 Defenders of The Cross and of The Faith. THE weakening of the Ancient Greek City States and the proliferation of the Alexandrian Empire open the way for the Roman Empire. Constantine the Great becomes sole Emperor of the Roman Empire, based on his military victory over Maxentius in 312 A.D. outside of Rome. Constantine moves the seat of the Roman Empire from Rome to Byzantium. The City becomes his namesake, that is, Constantinople and together with the Empire they are known as the New Rome, the Second Rome, the Eastern Roman Empire, Byzantium, and carry the magical name of Valentia. The Fourth Crusade finds Byzantium sacked and occupied by Western invaders from 1203 to 1261. The Byzantine presence survives during that period by the rise of two Empires. One is founded in Nicaea by the Lascaris Dynasty and the other thrives in Trebizond under the Comnenus Dynasty. In 1261 Nicaean superiority recaptures Constantinople and Byzantium lasts until 1453 when the City falls to the Ottoman invaders. Trebizond fares better and remains in power until 1461 when it too falls to the same invading force. There was also the cultural city of Mystras, capital of the Despotate of like name, nestled on the first slopes of Mt. Taygetos and adjacent to Sparta. It lasted from 1348 to 1460 when it too succumbed to the Turk. The aggregate of all these final events marks the true Fall of the Roman Empire—yet, only in a geopolitical sense and not ever in a socio-cultural sense. Witness the enduring Western Civilization,. The front line defense of the Western world thus fails and the Asiatic non-Christian presence comes face to face with Europe at a crucial geographical juncture. This problematic actuality casts long shadows on dubious alliances attempted by Westerners with non-Europeans in that area. The escape from Byzantium to the West of a large number of intellectual and cultivated people brings about the Renaissance of Europe. An expanding consequence of that, in Western terms, is the Discovery of the Americas which establishes the inevitable reality that the New World is NEW BYZANTIUM. 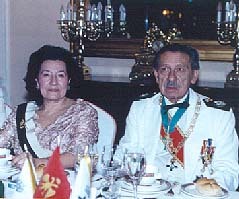 HIS IMPERIAL AND ROYAL HIGHNESS PRINCE THEODORE IX LASCARIS COMNENUS of the Byzantine House of Constantinople with PRINCESS GABRIELA reside with the Family in Venezuela. Prince Theodore IX was by Primogeniture the HIGH PROTECTOR of the House and all of its Institutions. 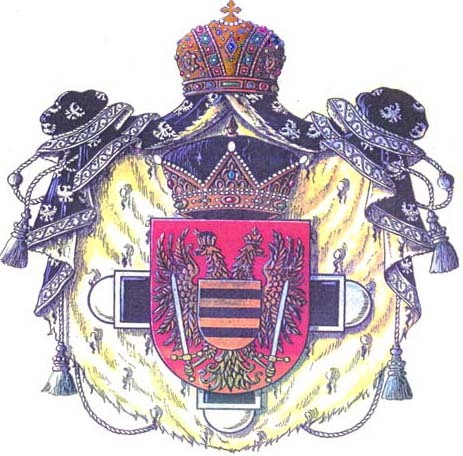 These include the UNION OF BYZANTINE ARISTOCRACY; the ORDER OF SAINTS CONSTANTINE THE GREAT AND HELEN; the ORDER OF SAINT EUGENE OF TREBIZOND; and the INTERNATIONAL PHILO-BYZANTINE ACADEMY AND UNIVERSITY (IPHBAU). He was the GRAND MASTER of the Constantinian Helenian Order, while his younger brother, H. I. AND R. H. PRINCE JUAN ARCADIO LASCARIS COMNENUS is the GRAND MASTER of the Eugenian Order. Prince Theodore IX was a Doctor of Laws and Philosophy; University Professor at national and foreign educational institutions [in the U.S.A. at Notre Dame University, South Bend, IN]; critic; author; essayist; writer of an acknowledged and far reaching trajectory; co-worker for international publications in the country; had conducted conferences in various countries in the Continents of Europe and America; and had received decorations such as the Order of Miranda and others for his pedagogical work. He received Honorary Doctorates at Universities in Canada, the United States of America, Argentina and France among others. Among works published by the Prince are: The Problems and Teaching of the United Nations and of UNESCO; Introduction to Philosophy and Greek Philosophy; The Philosophies of Cultures and the Mass Societies; Historical Juridical Study of the Independent Orders of Chivalry; Philosophy of Venezuelan Education; Fifth Centenary: Encounters and Divergencies on the Half Millennium of Discovery of the New World..
By: Dr. Theodore Lascaris Comnenus. Valencia, Venezuela, January 1, 1997. 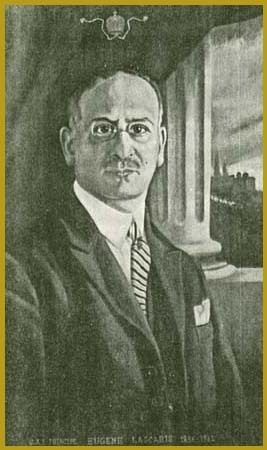 Prior to the Spanish Civil War of 1936, a PRO-LASCARIS Committee established in Madrid advanced the candidacy of my father, Prince Eugene Lascaris, for the Crowns of Greece and Cyprus, particularly in the years 1923 and 1935. In the post-World War II period, in 1946, he gave international character to the Greek-Byzantine Institution of the Sovereign (i.e., Independent) Order of Constantine the Great with its feminine branch of Saint Helen; and beginning in 1948, the Review PARTHENON was published -- an organ of the "Greek-Spanish Cultural Association" with its seat in Madrid. In 1950, as a cultural extension of the Order, my father founded the "Philo -Byzantine Academy and University Magistrorum." In 1953 in Madrid was created the institute and magazine CONTRA-LASCARIS presided by an ex-Falangist and ex-carlosoctavista named "Le petit Goebles," and his "ad-latere" an author, who through a publication "Hidalguía" presented themselves as implacable adversaries of Prince Eugene, of our Family, and of our Institutions. Such a person wished to bring honor to his name by linking up with us who unfortunately are not sectarian integristas. Rodríguez Maseda affirms that fanatics in their ignorance border on IDIOCY, being capable of the most incredible doings in word and in deed. 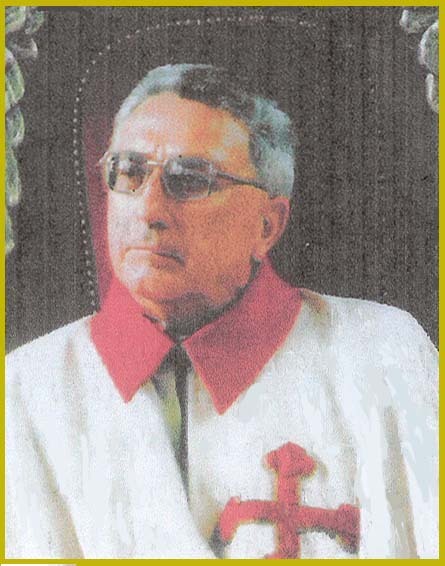 Those mentioned pertained to a group that in the fifties and sixties was led by a politico and his ministers, members of the sect integrista nocedaliana, protected by the totalitarian STATE. The CONTRA-LASCARIS stem since '53 to date, developing a campaign based on contemptuous insults, denigration and attacks on prestige. With ample financial support, they are dedicated to sending letters and pamphlets everywhere using their "executioners." While the Lascaris Comnenus Institutions promote "Human Rights" and the "Declaration of Rights of the United Nations," of the OAS and of UNESCO, in favor of understanding, of the comprehension of fraternity, the integristas nocedalianos CONTRAS are enemies of the truth, of reason, and of liberty, by submitting to fanatical obscurantism, isolated from all logic. As so wisely articulates the top advisor of President Clinton, George Stephanopoulos, when personal attacks are launched, it is a deliberate strategy intended not to debate the real problems. Which in our case is the defense of Human Rights, the freedom of expression and union, as opposed to obscurantism. More precisely, persecutions by word as well as by act is what gave strength to Christianity. Only the PRO, or so to speak the POSITIVE produces thought and action. CONTRA NEGATIVISM for its malignity is the DRAGON that will be annihilated by our master Megalomartyr Saint George of Cappadocia, renowned Captain of the PRO-LASCARIS OF BYZANTIUM. On October 16, 1935, in the residence of Ricla in Spain. Count of Castellano; don Vicente Lope Onde and don Jose Orera de Ibarz. The Greek people accept the term "King of the Hellenes"
and not "King of Greece." yet will not accept to be "subjects" under royal authority. H. I and R. H.
Juan Arcadio Lascaris Comneno (Ioannis Arkadios LASKARIS-KOMNENOS) was born in 1926 in Zaragoza, Spain. He studied Sociology, Law and History and is Doctor of Social Sciences and Doctor of Civil Law. He lived and worked in Spain, U.S.A. and in countries of Central and South America. His written work is large and expands into areas such as Public Health and Care, Literature, History of Spain and of the Byzantine Empire. He is the author of "Collection of Legislation on Health" in twenty-five volumes. 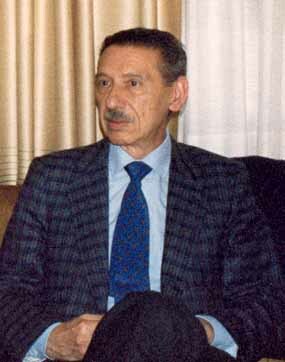 His works were published in 1988 on "Legislation on Personnel" 800 pages, and "Pharmaceutics" in two volumes in 1500 pages and in 1989 his work "Teaching and Research" 710 pages. In the area of Social Care, the institution for Spain’s National Care has honored him with the Prize for his work "Alvaro Lopez Nuñez and Social Care in Spain." His great Love for Greece, Byzantine civilization and Orthodoxy cannot escape anyone’s notice. There is also a long list of intellectual institutions that have taken Ioannis Arkadios Laskaris Komnenos into their fold. Many honorary distinctions and moral rewards have also been bestowed upon him during his half-century of contribution to the scientific environment. A lover of ecclesiastical fine arts, he devotes his free time in Byzantine iconography. He resides permanently in Madrid. He is married to María Isabela de Monroy-Blanco and they have two daughters, María Eugenia and Helena. Ο Juan Arcadio Lascaris Comneno (Ιωάννης Αρκάδιος ΛΑΣΚΑΡΙΣ-ΚΟΜΝΗΝΟΣ) γεννήθηκε το 1926 στή Σαραγόζα της Ισπανίας. Σπούδασε Κοινωνιολογία, Νομικά και Ιστορία και είναι Διδάκτωρ Κοινωνικών Επιστημών και Διδάκτωρ Αστικού Δικαίου. Έζησε και εργάστηκε στήν Ισπανία, τις Η.Π.Α. και σε χώρες της Κεντρικής και Νότιας Αμερικής. Τό συγγραφικό του έργο είναι μεγάλο και επεκτείνεται σε τομείς όπως η Δημοσία Υγεία και Πρόνοια, η Λογοτεχνία, η Ιστορία της Ισπανίας και της Βυζαντινής Αυτοκρατορίας. Είναι συγγραφέας της «Συλλογής Νομοθεσιών περί Υγείας» σε εικοσιπέντε τόμους. Τό 1988 εξεδόθησαν τά έργα του «Νομοθεσία περί Προσωπικού» 800 σελίδων, και «Φαρμακευτική» σε δύο τόμους 1500 σελίδων και το 1989 το έργο του «Διδακτική και Έρευνα» 710 σελίδων. Στόν Τομέα της Κοινωνικής Πρόνοιας έχει τιμηθεί για το έργο του «Αλβάρο Λόπεθ Νούνιεθ και η Κοινωνική Πρόνοια στήν Ισπανία» με το Βραβείο τού Εθνικού Ιδρύματος Πρόνοιας της Ισπανίας. Η μεγάλη αγάπη του για την Ελλάδα, το βυζαντινό πολιτισμό και τήν Ορθοδοξία δέν περνά από κανένα απαρατήρητη. Μακρύς είναι και ο κατάλογος των πνευματικών ιδρυμάτων που ενέταξαν τον Ιωάννη Λάσκαρι Κομνηνό στούς κόλπους των. Πλείστες είναι καί οι τιμητικές διακρίσεις και ηθικές αμοιβές που του έχουν επανεμεθεί στο πέραν του μισού αιώνα προσφοράς του στόν επιστημονικό χώρο. Λάτρης της εκκλησιαστικής εικαστικής τέχνης, επιδίδεται στις ελεύθερες του ώρες στη βυζαντινή αγιογραφία. Κατοικεί μόνιμα στη Μαδρίτη. Είναι νυμφευμένος μέ την Μαρία Ισαβέλα ντε Μονρόϊ-Μπλάνκο και έχουν δυο θυγατέρες, τη Μαρία Ευγενία και την Έλενα. 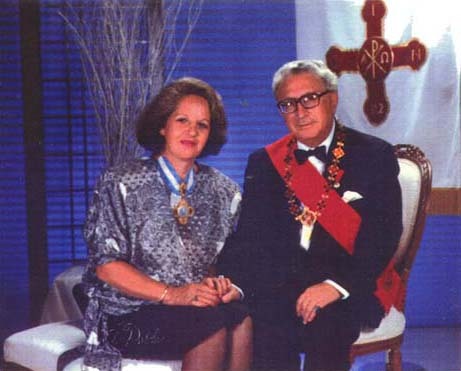 In the event of my physical inability duly to attend to my functions as Grand Master or because of my demise, the said office will be assumed immediately by my first-born daughter, the Princess Dr. MARIA EUGENIA ISABEL LASCARIS COMNENUS MONROY as Supreme Grand Dame of the same [ i.e., of the Order of Saint Eugene of Trebizond ]. My second daughter, the Princess Dr. HELENA ISABEL EIRENE LASCARIS COMNENUS MONROY, will at the same time assume the Lieutenancy General, thus fulfilling the condition established in Section b) of the Second Constitution. 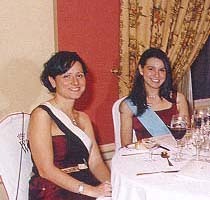 On such occasion when my successor to the Grand Magistery should be unable to continue in her post because of impossibility or death, said Grand Magistery will be assumed by my second daughter, the Princess Dr. Helena Isabel Eirene, who until that moment will have fulfilled the charge of the Lieutenancy General. a) Older than 18 years. b) Will have taken steps whereby the surname Lascaris would be incorporated in his name in the first place; which is to say, his descendants will always be able to be named Lascaris and will be able to continue as members of the House of Lascaris Comnenus. Should such a male not exist, it would pass to the first-born male of my second daughter, Dr Helena Isabel Eirene, as long as he would fulfill the conditions indicated in Sections a) and b) of the previous Article. If none of these males existed it could pass to the daughters of both, following the same order and conditions. If none of both previously cited daughters had descendants, the succession to the Grand Magistery would be determined by the Grand Protector of the Order or Chief of the Imperial House of the Lascaris Comnenus. 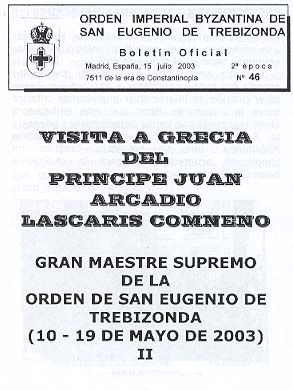 Given in Madrid on the twenty-fourth of June of the year 2001 of the Birth of the Savior or 7509 of the Era of Constantinople. 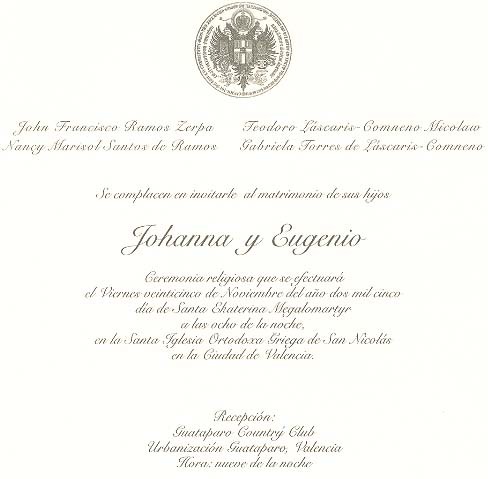 este puesto mi hija primogénita la princesa Da MARIA EUGENIA ISABEL LASCARIS COMNENO MONROY como Gran Dama Suprema de la misma. así la condici6n establecida en el Apartado b) de la Constitucl6n Segunda. asumido por mi segunda hija la princesa Da Helena Isabel Irene, que hasta ahora desempeñaba el cargo de Lugarteniente General. Láscaris y puedan continuar siendo miembros de la Casa Láscaris Comneno. a) y b) del artículo anterior. siguiendo el mismo orden y condiciones. Casa Imperial y Real de los Láscaris Comnenos. Dado en Madrid, a veinticuatro de junio del año 2001 del Nacimiento del Salvador y 7509 de la Era de Constantinopla. Perpetuation of the Byzantine Idea incarnated in a Dynasty . . . living evidence spanning some 350 years. It is an impossibility for the true Order of Saint Constantine the Great and Saint Helen, which exists under the legal authority of The House of Laskaris Komnenos of Constantinople, ever to come under the control or influence of the Vatican. This fact prevails despite the pointless efforts of frustrated detractors who attempt to propagate false arguments. Only the House can abdicate or reassign its historical rights. We suppose that Mr. Guy Stair Sainty publishes his defamatory page on account of his being Vice Chancellor of the Constantinian Order of the Two Sicilies; and by which he considers to have disposed of the Lascaris Comnenus -- true holders-in-trust of the authentic Order of Saint Constantine the Great, who have conserved and conveyed it from generation to generation until our days. There is a great number of publications, writings, documents, etc. that attest to these facts. 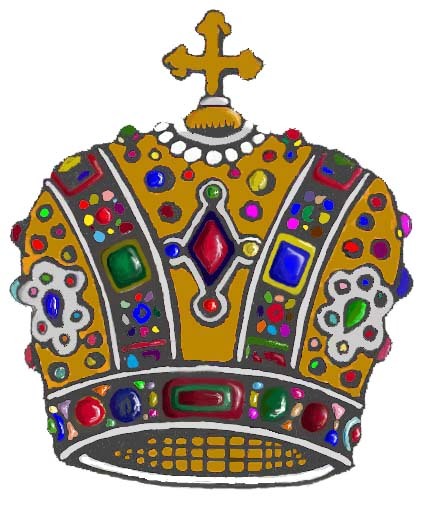 Bear in mind that the said Order of the Two Sicilies as also that held by the Bourbons of Parma are orders exclusively of the Kingdom of the Two Sicilies, but they can never be considered (as they declare) successors of the one founded by Constantine the Great, Emperor of Byzantium. 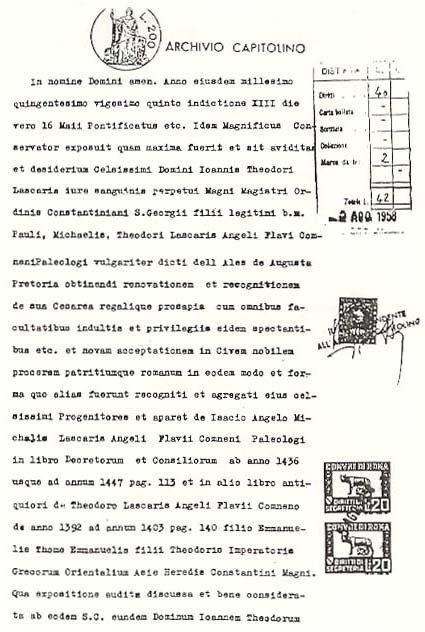 To make this assertion it suffices to state (as it has been published already many times) that according to them it [the Constantinian Order] was purchased of an Albanian family that was said to be Angeloi (of the Angeloi of Byzantium), but whose real name was Span. Yet, as it can be proven, an Order can never be an object of a sale, and much less to be done by a family having no rights whatsoever to same. In view of these facts, the Lascaris Comnenus Family made the pertinent protestations; and thus it was recognized by the Senate of the Roman People (see the corresponding historic legal Registration in the Archives of the SPQR). 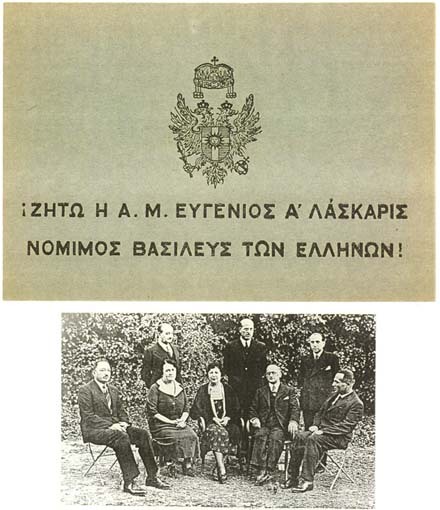 We wish to point out that if our Family had not the origin it claims: How is it possible in the course of the years always to have been recognized by the Greek People, hundreds of Greek institutions, centers, etc.? 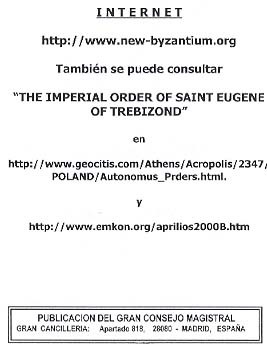 Why was it that His Beatitude the Greek Orthodox Patriarch of Jerusalem granted the Grand Cordon of the Holy Sepulcher to the Princes Eugene II and Theodore IX; and His Beatitude Eireneos – for whom is felt a great friendship and affection – granted that Order to Prince Juan Arcadio? The brother, Prince Juan Arcadio, has been received during all of his sojourns in Greece with full solemnity by advocates and institutions. We cite that with the participation of the Greek Combat Veterans and in the custody of the Evzone Guard in Athens he placed a “Laurel Wreath” at the Tomb of the Unknown Soldier at the Greek Parliament building at Syntagma Square. This Prince has been recognized as leader of the Hellenic patriotic movement of various Pontian groups of Greece, the United States, Ukraine, and other nations. Thus, the central Pontian Library, “Captain Eucleides,” at Aharnon in Athens has been put under his name, having himself attended the inaugural ceremony on May 11, 2003. He was named member of Parnassus of Athens, addressing the corresponding conference of induction. He has addressed various conferences at the Grand Hall of the University of Athens and at diverse centers in Athens, Patras, Sparta, Mistras, Lamia, Volos, Larisa, Nafpaktos, etc. And in Athens this year, 2006, he celebrated his Birthday with the participation of more than three hundred persons and in the company of the former Prime Minister of Greece and of the Archons of the Ecumenical Patriarchate of Constantinople. Furthermore, in recognition of cooperation by his Hellenic compatriots, he has bestowed fifteen plaques of appreciation to as many personalities, including Mayors, Metropolitans of the Orthodox Church, and Generals of the Greek Armed Forces. We do not wish to press on with more data from the immense number of activities the Family has brought forth. It will be said only that they number in hundreds of publications and works. In a word, the Family has not ceased in all their lives to demonstrate in ample form their great personal quality and great affection for their Hellenic motherland. the information below appears garbled, view the PDF File. Prefect in the and Dalmatia. Crete (1574). Royal Princess legitimate King of the Hellenes. I I m. Ipapandi Kutzurakis. I I b. 1965 . b. 1971. I I m. Maria Isabel Monroy. I I b. 1975. b. 1977. 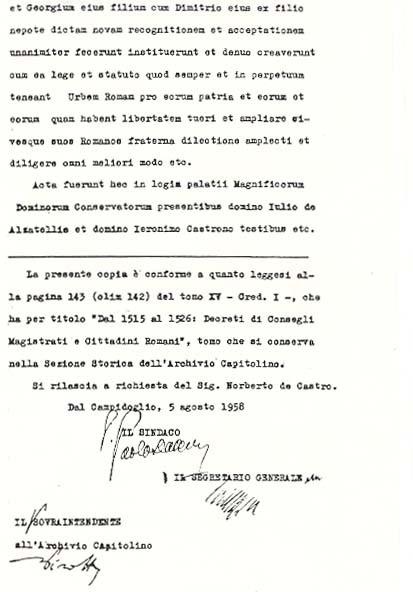 Excerpt: "The Constantinian Order, Subject of International Law"
The decision of the Supreme Court and College of arms of Costa Rica of August 15, 1947 previously cited confirms (Paragraph 10) the filiation of the Lascaris-Comnenus Dynasty based on concrete documents, authentic and true, not contested, and its princely category and other preeminences as came to be respected in the West by imperial Documents (of Germany), Roman pontifical bulls, royal decrees and by the Illustrious Roman Senate and People "namely, of the German Emperors Frederick II in Linz, Maximilian II in Ratisbona, Ferdinand II in 1630, Leopold I, Charles VI and III as King of Hungary, April 5, 1720 and Joseph I, March 27, 1710; diplomas of the Roman Pontiffs Callixtus III, Pius II, Sixtus IV, Innocentius VIII, Leo X, Paul III, Marcellus II, Paul IV, Pius V, Sixtus V, etc. and Clement XI, January 6, 1709; and the Book of Decrees of the Illustrious Roman Senate and People 1392-1403, f. 140, 1436-1447, f. 113, 1515-1525 (May 16, 1525, Ind. 13), f. 142."(8). 16-V-1525, Lib. Decr. 1515/1526, f. 142). In paragraphs 11 through 13 the Decision presents the line of succession of the members of the Lascaris Dynasty, while in paragraph 14 it takes up again the thread of succession starting with 1718 to our present days. (9) The actual Grand Master is H.I. and R.H. 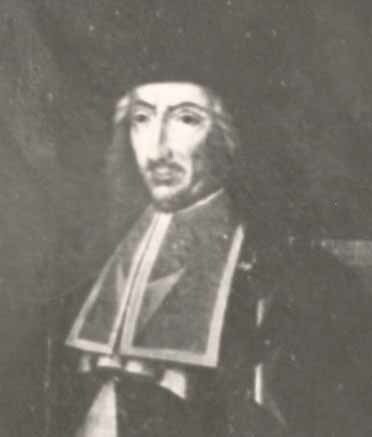 Prince Theodore IX Lascaris-Comnenus, recognized jurist and philosopher as well as University Professor (ret. ), writer and author of a number of works, several of which have received prizes in the countries of Europe and the Americas, visiting professor in Europe, the United States and Latin America. Among his works it is well to mention: "The Problems and teachings of the United Nations, UNO and of UNESCO," University of Carabobo, Valencia, Venezuela, 1974; "Introduction to Philosophy and Greek Philosophy," ibid., 1975; "Tagmatology. 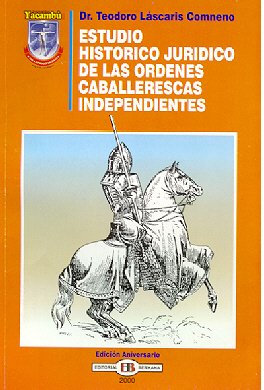 Historical Juridical Study of Chivalric Orders,: ibid., 1978; "Fifth Centenary, Encounters and dis-Encounters on the Half Millennium from the Discovery of the New World," National Council of Culture, Caracas, 1993. (8) The Decision in continuation cites the Decrees of the Council (Councils) of 1556, 1594, 1641, 1644, 1649, 1679, and February 28, 1718 signed by the conservators of the archives before Notaries Public mentioned by their first and last names, by which documents and diplomas "attests that up to this date the Chief of this family exhibited overt use of the Office of Grand Master of the Sovereign Imperial Order of Constantine the Great, or of the Constantinian and Heraclian Knights under the Patronage of Saint George." (9) Cf. The Statutes of the Order in addition to the works cited. "Antecedents." Whereas, 4, 5, 6, 7, 8 and 9. We have mentioned at the end of Chapter II of the present essay that the juridical personality of the Order has not been extinguished in International Law despite the fact that the territory was conquered and occupied (similar to the case of Malta), and that the legitimate imperial family has not been deprived of its constitutional rights in view of the Turkish conquerors, staunch enemies of Christianity in general and of Byzantium in particular. (10) Op. cit., p. 51 etc. (11) Op. cit., pp. 57-58. Cf. also the decisions of the Tribunal of Trani of October 26, 1948; the Pretura of Vico del Gargano of March 23, 1949 and June 27, 1949 (op. cit., p. 61). 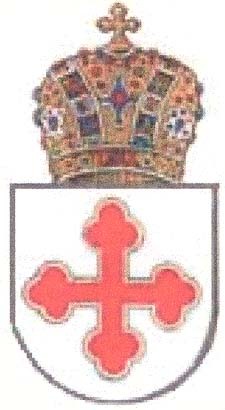 Also valid for the Constantinian Order is the reasoning employed by the Court in Nanni vs Pace in favor of the Order of Malta, that is: that the modern theory of the subjects of International Law recognizes a number of collective units with universal supranational objectives, eliminating the territorial confines and boundaries, which will give it "its international juridical personality": cf. The Constitutive Letters of the UN, Art. 104 and 105; EC, Art. 210 and 211; OAS, Art. 139; also of the Arab League, Art. 14; and of the African Unity, Art. XXXI. All this doctrine is based on the tradition confirmed by the Decrees of May 16, 1525 and of February 28, 1718 of the Senate of Rome and the Diploma of May 5, 1720 of the Imperial Chancellery of Vienna by the Emperor Charles VI of Hapsburg, and as Charles III in his function as King of Hungary, and worthy to say, the recognition of the "iure sanguinis" privileges in favor of John Anthony I Lascaris and his male descendants, such as of the Byzantine Emperors with the inherent quality of "fons honorum," or that is, the faculty to concede nobility titles and dignities, to nominate Constantinian knights, etc. John Anthony I Lascaris as well as his dynastic predecessors and descendants have never made use of their palatine privileges in the name of the Holy Roman Empire of the West because all of the concessions of titles by the Porfyrogenitoi [those born in the Purple] were effectuated under the imperial Byzantine title to confirm in this way their independence and to protect their postures with respect to the renewal of the Empire of the East to which they had the right not seriously debated or questioned by anyone. Constantine the Great began his eventful climb in York, England and reached the apex of his achievement in Constantinople, the City that he founded and named after himself (Constantine+Polis [city]=Constantinople). By means of these pages, our readers travel through time, touching upon the early periods, including that of Constantine, of historical Constantinople, and of Hagia Sophia—the nexus of the Christian world—to arrive at places and events of our present day. Our readers reach the outermost limit to which both Eastern and Western Christian groups expanded, bringing forth the flower of Western Civilization. That limit is the Western Hemisphere as a whole, and in particular the coast of California near San Francisco and the Golden Gate Bridge where the two groups converged as they approached from the North and from the South.